“They took very good care of my place. I trusted them completely,” she said. During cross, Overton acknowledged that Patrick left her a $100 tip at the truck stop one night. She also said the men paid her electric bill and bought her a new set of pots and pans. Montana resident Roxsanna Ryan, who home schooled her 12 children, said she wasn’t surprised when her middle child Jake Ryan, 28, chose to stay at the Malheur National Wildlife Refuge last winter when he accompanied his father and brothers on a drive from their home to deliver community-donated goods to the occupiers in Oregon. She said the next time she heard from Jake Ryan was the night of Jan. 26, 2016, in a “goodbye” call, his voice shaking and in fear following the police fatal shooting of occupation spokesman Robert “LaVoy” Finicum. 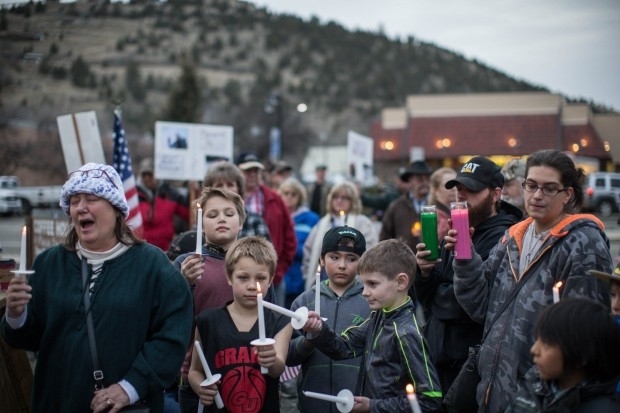 Ryan’s mother was one of the many witnesses called Wednesday by defense lawyers in the second Oregon standoff trial to testify about the four defendants’ character and their motivations in going to the refuge last winter. Prosecutors sought to limit repetitive testimony from defense witnesses about the atmosphere they found at the refuge when visiting. Jake Ryan, Jason Patrick, Duane Ehmer and Darryl Thorn are charged with conspiring to impede federal employees from doing their work at the Malheur National Wildlife Refuge through intimidation, threats or force. “More than anything I wanted my children to be able to think for themselves,” Roxsanna Ryan said. Roxsanna Ryan said she has raised her children to read the U.S Constitution and the Bible. A typical writing assignment would be asking them to copy an amendment of the U.S. Constitution and then explain what they thought it meant, she said. Until his arrest on Jan. 27, 2016, Jake Ryan lived on his family’s 30-acre farm in the small town of Plains, Montana, its population of about 1,200, his mother said. She said he was heavily influenced by a man considered an “adopted grandfather,” who suffered a bankruptcy and spoke to her boys about his support for limited government. She said the family also rallied for the election of a so-called “constitutional sheriff” in their county. Since Jake Ryan had no cell phone of his own or a computer at their house, Jake Ryan’s older brother stopped by frequently and encouraged his younger brother to look at YouTube videos that occupation leader Ammon Bundy had posted about the refuge seizure, she said. “The influence of LaVoy and Ammon were very strong because they spoke to the things that meant so much to Jake,” his mother said. The next time Jake Ryan’s mom heard from him was when he was at the FBI checkpoint, having left the refuge on Jan. 27, 2016. Ryan wasn’t arrested until April, caught sleeping in a stranger’s shed in Clark County, Washington. He had a handgun by his side, according to the Clark County sheriff’s deputy who took him into custody. Earlier in the day, jurors heard from local Burns and Vale residents who visited the refuge during the occupation, and character witnesses for Patrick and Ehmer. Patricia Overton, who works at the Eddies Fastbreak Truck Stop in Burns, said she met Patrick and Ryan Payne in December 2015, waiting on them. She invited them to park Payne’s pickup full of sleeping bags under her carport, and they ended up staying in her horse trailer’s living quarters and using a guest room in her home while she was away visiting family in Nebraska from about Dec. 23, 2015 until Jan. 2, 2016. It was at her home that Ammon Bundy testified this week that he first shared his plan to seize the refuge with others. Debra Ann Johnson, a Burns resident, rancher’s wife and mother of five children, said she visited the refuge with her children on Jan. 4, 2016, after the local schools closed down for a week after the holiday break. When she drove up to the refuge gate, she was surrounded by a media crush, she said. “Everybody wanted to know what in the world this crazy lady was doing there with her kids,” she testified. She called the refuge before arriving, and spent about three hours there. She recalled meeting Patrick. “He just wanted people to read the Constitution and know it for themselves,” she said. Pat Horlacher, who lives along Highway 205 a few miles outside of Burns, called the atmosphere at the refuge during the occupation peaceful, calm and “laid back,” and said the media coverage “spewed” a lot of “baloney” about it being threatening. Morrow County sheriff’s deputy Todd Siex, who met Ehmer in Irrigon, Oregon, described him as a “peaceful individual.” Prosecutors then brought up 1998 misdemeanor convictions Ehmer had in Kansas for aggravated assault on an officer. His defense lawyer pointed out that was at least 18 years old. Kenneth Medenbach, who was acquitted of conspiracy in a trial last fall, testified that he had “Closed Permanently” signs ordered and made and screwed them to the U.S. Bureau of Land Management’s dispatch center in Hines, outside of Burns in January 2016. He said he did so after consulting with Ammon Bundy and his brother Ryan Bundy, but with none of the four defendants now on trial. Why? “To show the people of Harney County they were going to get their property back. It was unconstitutionally stolen from them in the 1800s..We’d already taken it by adverse possession,” he said. Just as defense lawyer Andrew Kohlmetz was about to ask whether it was Medenbach’s opinion that adverse possession is a legal mechanism to take control of federal property, prosecutor Ethan Knight asked to address the court outside the presence of the jury. Once the jury left, Knight urged the court to admonish attorneys not to ask additional questions about adverse possession. He also successfully argued for the judge to read a stipulation to jurors later that the refuge is federal property and adverse possession is not a legal defense to the crimes charged. The judge directed Medenbach to just answer the questions asked and not go beyond the scope of each or she’d strike all his testimony. Turning to the judge from the witness stand, Medenbach protested, “I took an oath to tell the truth, the whole truth and nothing but the truth.” But moments later, he said he’d abide by her wishes. Court testimony ended early, with defense lawyers having run out of witnesses to call on Wednesday, but they said they had a full line up for Thursday. They’re expected to rest their case by late Monday, and the jury could begin deliberating sometime next week.